The U.S. economy added 304,000 jobs in January even as overall unemployment ticked higher, driven in part by the weeks-long partial U.S. government shutdown. Total non-farm payroll employment increased by 304,000 in January, and the unemployment rate edged up to 4 percent, the highest rate in seven months, the U.S. Bureau of Labor Statistics (BLS) reported Friday. 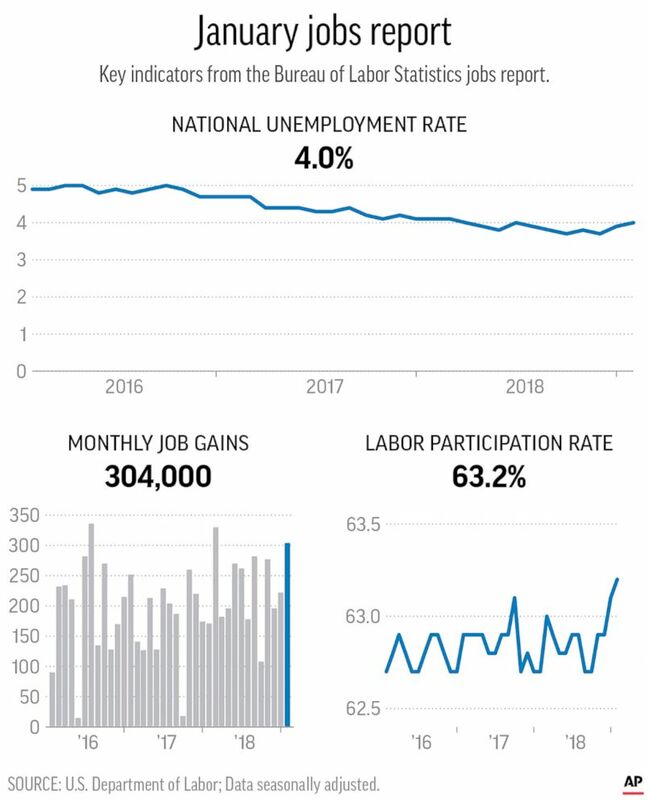 Graphic shows the national unemployment rate, job gains and the labor participation rate from the January 2019 jobs report. Nearly twice as many jobs were added than what economists forecast. Wages also rose, up 3.2 percent on the year, “potentially reflecting the boost to workers’ paychecks from the 19 state minimum wage increases that took effect on January 1,” the Economic Policy Institute economist Elise Gould wrote in a note. The number of unemployed people, however, rose to 6.5 million in January, according to the report. The number of unemployed people on “temporary layoff” also rose by 175,000 last month, mostly due to federal government workers, the report said. 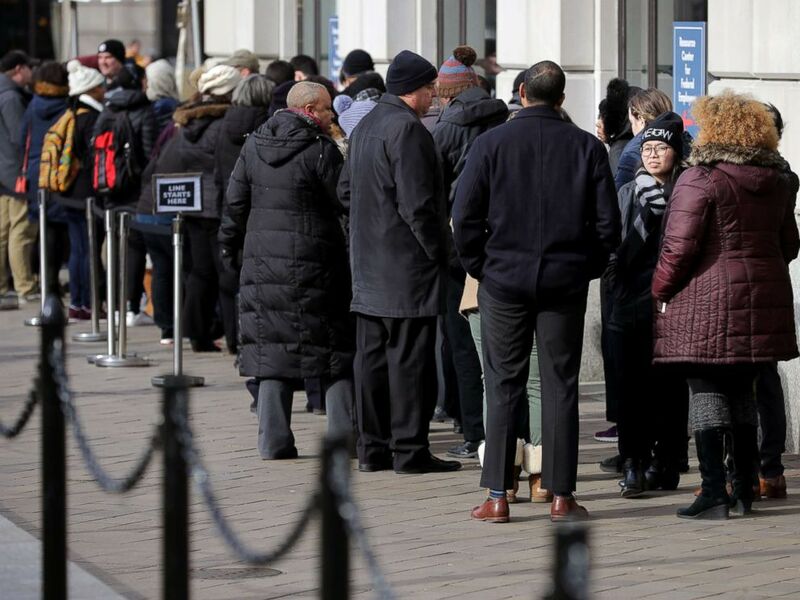 An addition 5.1 million people were working part-time involuntarily, also possibly attributed to the shutdown, according to the BLS report. However, because many federal employees were still getting paid the week of Jan. 12, when the Department of Labor conducts its survey, the report may not provide an accurate picture of the economy. U.S. government workers who were working without pay or were furloughed were considered employed. Federal employees continue to line up outside outside the World Central Kitchen for free food and coffee Jan. 28, 2019 in Washington, D.C. The Labor Department’s job report follows the Federal Reserve’s announcement earlier this week to hold interest rates steady, preparing for a slowing economy. The Fed had been raising interest rates since 2015. The additional jobs were mostly in the leisure and hospitality, construction, health care, mining, and transportation and warehousing industries, according to the BLS report. Last month’s job report was also considered bullish, but the Labor Department has now readjusted its numbers. December job numbers were revised down by 90,000 to reflect 222,000 jobs added to the economy, not the previously reported 312,000. BLS often revises its numbers, but this one time the move is larger than usual. ABC News’ Rebecca Jarvis contributed to this report. Heres what you need to know about the cases in the special counsels probe. Questions surrounding the Trump campaigns Russian contacts remain unresolved. Democrats have criticized the Justice Departments plans for the Mueller report. The highly anticipated report is expected to run nearly 400 pages. The famed cathedral is going up in flames.